Jean-Louis Chave's estate was gifted with a sunny July. While the 2018 growing season in France's Rhône Valley had some travails, vintners are happy with the quality of the harvest. 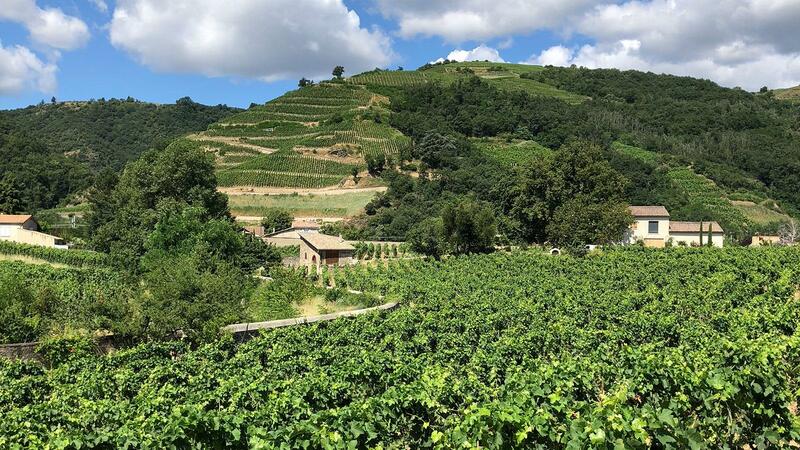 Early reports indicate that both the Northern and Southern Rhône's recent hot streak of vintages that started with 2015 will continue, though yields in the south are significantly down. The season started well enough, with a mild spring following a wet winter. "That gave us the opportunity to build back the soil's water reserve," says Michel Chapoutier, the Tain-based vigneron and owner of M. Chapoutier. A bit of rain nicked the flowering but the initial fruit set was healthy overall, "leading to a full-potential size of crop," says Philippe Guigal, of E. Guigal in Ampuis. A particularly wet June provided the season's most difficult test, leading to unusually high mildew pressures, with the Southern Rhône bearing the brunt of it. "The disease pressure was very strong. The frequency for spraying was very high and very important to avoid losing too much crop," says Bastien Tardieu of Southern Rhône–based négociant Tardieu-Laurent. "Then the summer and [late] season were dry and warm. Fortunately, the pressure lowered. So, it was an easy vintage … [between] 2015 and 2017 in terms of quality. But the crop [loss] is significant." "At the end of June, the weather drastically changed, with solid sunshine," says Jean-Louis Chave. "We started harvest on Sept. 3 with the white Hermitage, followed right after with red St.-Joseph and red Hermitage. The weather during the harvest was particularly hot, so good cooling equipment was necessary to prevent early and quick fermentations. So far the wines are black in color. Malolactic will be a key factor as the pHs are a bit high." In addition to the discrepancy in yields between north and south, the north also saw a shorter harvest period, as the region ripened quickly and evenly. The south was more spread out, with varying microclimates dealing with the extra humidity issues and more heterogeneous ripening. "All Guigal northern appellations were harvested during 22 days," says Guigal. "Harvest at Nalys (the Guigals' recently acquired Châteauneuf property) lasted five weeks, and there were many interruptions needed to obtain a full ripeness of the grapes. The Grenache was very affected by the mildew, but the Syrah ripened well, with a decent size of crop." He reports overall quality is good in the Southern Rhône, but that yields are down by as much as 50 percent in some vineyards.